Treat yourself to renewal from the inside out. With blankets for support, this nurturing practice uses the breath to soften the body while the mind grows present, allowing you to open deeply. We explore how subtle shifts in attitude and alignment weave into a new sense of balanced awareness and support for the body, mind and senses. The results will leave you refreshed, rejuvenated and lighter than air. and reduce proprioceptive input and cognitive responses. This is a process that facilitates repair and healing of all your cells, organs, and systems. Classes begin with a time to get grounded, be aware of the breath. There may be chanting or bells to bring you to the present moment. Some gentle breathing exercises in a seated position are typical to start. Gentle stretching or warm-up exercises may be included. You may be asked if there are certain things you prefer to work on (like a tight back or insomnia, for example) or certain poses you want to practice. Class is mostly focused on doing a few very comfortable poses for longer periods of time. 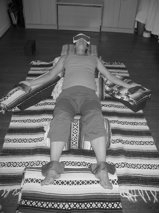 In restorative yoga, you have a set of props (including blankets, block, belt, eye mask and yoga mat). Each pose takes a few minutes to set up. You can expect to be on the floor, completely supported by blankets and other props and feel very, very comfortable. Adjustments can be made to assure you are supported in each pose. Poses are held for 10-15 minutes, sometimes longer, and your job is to rest and breathe, sinking deeper into an aware but more and more relaxed state. The last posture of class, you will be on your back in corpse pose (feet about a foot apart and toes to side, hands resting on the floor next to your hips with the palms up). This pose helps regulate the body by letting the blood circulate, balancing the energy, and activating the parasympathetic (calming) part of the nervous system. Often, beautiful yoga chants or the gong is played. You will then be asked to gently sit up with eyes closed, sitting for a few minutes, noticing your breath and how you feel. Class ends with an affirmation, chant, or chimes. what can you do to enhance your experience? Come to class hydrated, but do not eat anything substantial at least two hours beforehand. Be on time and ready to start when class begins. Wear comfortable, natural clothing and have bare feet. Bring warm socks and an extra layer in case you get cold. Be mindful and careful when setting up your props for the poses. Be honest if you are not completely comfortable and supported in each posture, and ask for help with adjustments. Be willing to breath through tension. Notice how you are before class, during and after. Be willing to feel whatever emerges for you, accept it with compassion for yourself and non-judgement. Be willing to let go. Commit to a regular practice. what to expect if you practice regularly? Your stress levels will drop. You will get perspective on your life, and start to feel peaceful and calm. Muscle tension, headaches, and other body stress will begin to dissipate, and people with auto-immune challenges will most likely start to feel stronger and healthier. You will feel refreshed, revitalied and relaxed.